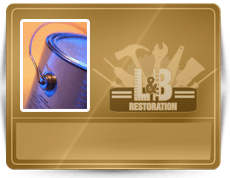 Restoration By L&B, LLC provides interior painting services for residential and commercial properties in Indianapolis, Indiana. We are qualified and insured home remodeling contractors with years of experience and training in the professional painting industry. 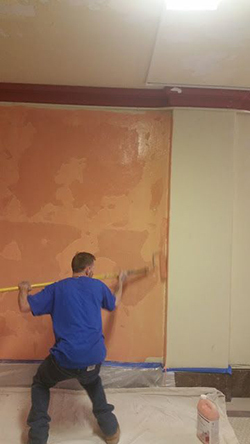 Outsourcing interior painting services is a cost-effective way to spruce up an outdated room, refinish a dungeon-like basement, or simply transform an area of your home into something new. A fresh coat of paint is not only appreciated by the property owner, it is also noticed and admired by guests and visitors as well. This is especially advantageous for commercial properties that service customers! An updated, clean, fresh look of a home or business can create a lively and inviting ambience that doesn’t burn the budget. Our professional painting consultants and remodeling contractors are true perfectionists at heart, and work diligently and resourcefully to render flawless results. 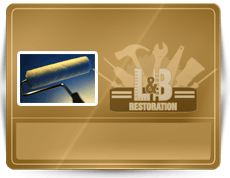 This means you can rest assure you are contracting the best painters for your home painting project when you call Restoration By L&B, LLC in Indianapolis, IN. Professional painting services is more than just paint. We start with a complete inspection and examination of wall and baseboard surfaces, followed by a thorough preparation of the surrounding area. This means covering all surfaces, furniture, and electronics with paper, drop cloths, and plastic tarps before sanding or patching drywall. Next, our painters carefully begin addressing any problematic nail pops, corner beads, cracks, and loose tape before applying any product or paint. These first steps are dynamic parts of a professional paint job. Careful preplanning is one of the most valuable steps to achieving exceptional painting results. 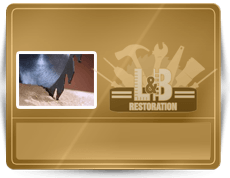 If old wallpaper needs removed, we will do this as well. We will also recoat old or outdated wallpaper at our client’s request. Depending on the condition of the wall paper and drywall, primer and paint may or may not be applied on top. As a customer convenience and a promise to always be prepared, our painting contractors always arrive to a job fully equipped with all the tools and products needed to carry out any obstacle or unexpected endeavor that may arise. This includes old, problematic wall paper, holes in walls, wood rot, and more! We truly believe that superior customer service starts far before, and should reach long after our jobs are through. We want our clients to be completely satisfied and know that we are always available for follow-up service, questions, and concerns. We never just pack, leave, and disappear for good! You can trust you are receiving paramount professionalism and quality service when you call our painting contractors! We even offer the most competitive prices in town; and if you find a better deal, we promise to BEAT IT! Dial 317-454-3612 and schedule an in-home consultation to assess your interior painting needs in Indianapolis, IN and its surrounding counties today!